Reports of Indian firms farming large tracts of land acquired in faraway countries like Uruguay and Madagascar have so far been convincingly sold as success stories showcasing an emerging India flexing its economic muscle. But there has been little introspection, if any, on the harm these Indian firms might be causing to the land and to the indigenous peoples living there. With foreign firms like Posco being criticised for taking land away from locals in Orissa, and with the Maoist problem being seen partly as the result of corporate greed for resources, can India turn away from problems caused by Indian firms leasing land abroad? Ethiopia—where more than a million hectares are being handed over to Indian firms at bargain prices, supressing local dissent and causing displacement of people—is an important case in point. Many are describing India as a “neo-coloniser”. The phenomenon has in fact received wide local coverage, with damning headlines like ‘Indian agribusiness devastates W. Ethiopia’. One such instance, involving a little-known Indian firm, came to light earlier this year when the US-based Solidarity Movement for a New Ethiopia (SMNE) revealed letters, copies of which Outlook has, to show how Verdanta Harvests was granted the lease of 3,012 hectares in the Gambela region despite opposition from affected locals, who were supported by none other than Ethiopian president Girma Wolde-Giorgis and the country’s Environment Protection Agency (EPA). According to these letters, affected locals from the Godere district went to meet the president in early 2010, when they learnt that their means of livelihood—including the forests where they hunted and gathered food—were threatened by an Indian firm that was going to clear the land to grow tea and other crops. Upholding their complaint, the president wrote to the EPA to ask the ministry of agricultural and rural development not to go ahead with this project. The EPA, too, argued in favour of the locals and said the short-term benefits of leasing the land do not offset the long-term environmental damage. The ministry, however, overlooked the objections, drawing a strong rebuke from the president, who wrote to the minister of agriculture on December 10, 2010, and told him to stop this project immediately. Yet, the firm got the go-ahead. Wolde-Giorgis has been described as a “figurehead” president, while real power rests with the dictatorial Prime Minister Meles Zenawi. Speaking to Outlook, the Addis Ababa-based CEO of Verdanta, Manojeet Barkataky, argued that his project was not one that would cause ‘concretisation’. “We will in fact be replacing two trees with 10,” he says, adding that the opposition to his project was incited by “vested interests”. He says subsequent dialogue with the locals had resolved the problem. “Those who had opposed us are now working with us,” he says. However, Barkataky steers clear of making any comments on the concerns expressed by the Ethiopian president and the EPA. The SMNE, on the other hand, hardly buys the peace that Barkataky talks of. Tamiru Ambelo, chairman of one of the affected villages, has been sacked for opposing the Verdanta project, they point out. Obang Metho of SMNE asks, “What would you do if an Ethiopian company came to India and evicted citizens from millions of hectares of their own land in order to grow food for export, affecting food security for generations? Would you stand for it?” In 2010, Ethiopia reportedly received more than 7,00,000 tonnes of food and over $2 billion in aid, but this hasn’t stopped it from leasing fertile land to foreign firms. Certain terms and conditions in contracts signed between the state and investors have also aggravated fears about land-grabbing. These include the state’s obligation to “deliver and hand over the vacant possession of leased land free of impediments” and to provide free security “against any riot, disturbance or any turbulent time”. Moreover, there is no clause that specifies how much of the produce must be sold in Ethiopia and how much shipped abroad. Ajay Vir Jakhar, editor of Farmers’ Forum, an agriculture magazine, who visited Ethiopia last year, argues against any “illusion” of these private companies going abroad to bolster India’s food security. “They are under no obligation to bring back the produce to India,” he says. Nowhere has criticism been more fierce than in the case of Karuturi, a Bangalore-based firm that has been granted access to about 3,00,000 hectares in Gambela at just $1.25 per year per hectare for 50 years. Allowed to grow palm, cereals and pulses, the company has a renewable contract. 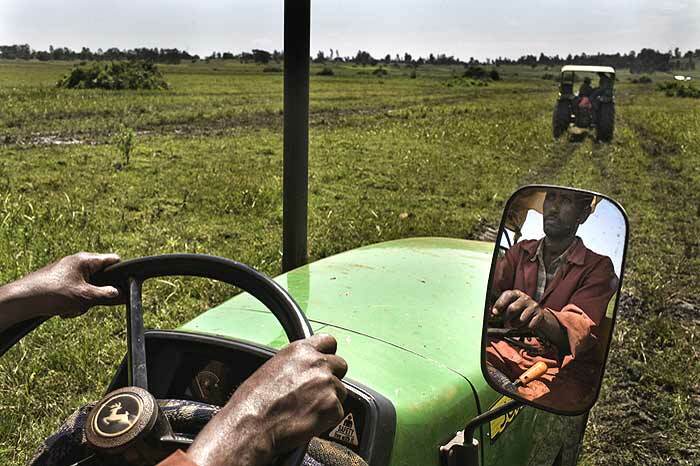 A report on the impact of land deals in Ethiopia, published in June by the Oakland Institute, California, has highlighted some concerns around Karuturi’s lease. These range from the forced relocation of locals to resettlement of villages and transfer of land coming under the Gambela National Park to Karuturi. Felix Horne, the report’s author, who has visited the region twice, tells Outlook of a habitation right at the entrance to the Karuturi project. “They are supposed to be moved out next year and there are already many soldiers in the vicinity. Karuturi may not be directly involved in it, but the way the land is being procured is certainly not in the best interests,” he says. Karuturi, in an e-mailed statement, has argued that the presence of soldiers has nothing to do with it but with neighbouring South Sudan and cross-border cattle conflicts. Locals have very little idea about the deals between the firms and the government, Horne points out. In most cases, especially in the case of Karuturi, people have no clue their land has been taken over and then leased out to a private developer until the firm’s bulldozers show up. This, says Horne, led to an incident in the village of Ilea, in Gambela, where Karuturi’s bulldozers, manned by Indians, destroyed all but one grave at a sacred burial site even before the locals had a chance to explain. “The fact they did not talk with the locals beforehand underlines the attitude that locals need not be engaged with,” he adds. The other controversial Indian involvement in Ethiopia relates to the presence of another little-known Indian firm—Whitefield Cotton—in a region called South Omo, where it has been given 10,000 hectares for cultivating cotton. This is in a region where people are being forcibly evicted by the government. Horne, who visited South Omo last year, tells Outlook of around 2,50,000 hectares being cleared there by the government using the military. “Those who opposed handing over their land were being assaulted and arrested,” says Horne, who was present in South Omo when these abuses took place. Given the lack of transparency, there are little means of knowing if people haven’t been forcibly moved out to clear out land for Whitefield. On the other hand, India’s Export Import Bank has also faced questions, given its $640 million line of credit to the Ethiopian government, officially to “develop its sugar industry”, especially when indigenous pastoralists are being forcibly moved out. Gurjit Singh, a former Indian ambassador to Ethiopia and presently the additional secretary (East and Southern Africa) at the MEA, counters that the Indian investment is only for building sugar factories in Tendaho, Wonji and Finchaa, locations away from South Omo. An Exim statement to Outlook also argued that its funding had no connection with what was going on in South Omo. But Horne maintains he still has his concerns, given the “murky nature of a transaction involving almost a billion dollars to a government with a horrendous human rights record”. Singh points out that this criticism of Indian firms grabbing land has come from a “segment of people (read the West) with a particular agenda” because it threatens their interests. So long as Indian firms were cultivating flowers and vegetables, there was no problem, because most of it was going to the West. The trouble started when Indian firms started getting into foodgrains,” he says. According to him, neither the Indian embassy nor the India Business Forum has received any complaint about any wrongdoings by Indian firms in Ethiopia. “In fact, the Ethiopian government has mentioned that Indian firms are more preferable because they create the maximum local employment, transfer of technology and creation of both inter- and intra-Africa trade,” he adds. Indian firms have also been accused of violating labour laws in Ethiopia by opposing the creation of workers’ unions. Tessema Heramo Bajigo, of the Confederation of Ethiopian Trade Unions, points out that as many as 45 per cent of Indian compaies operating in his country haven’t allowed their workers to form unions. “They do not want to give their workforce employment benefits like leave, including maternity leave, salary increments and safety and health benefits. This is a violation of Ethiopian law,” he says. Given the scenario, many, including Indians, are now asking for greater transparency. Anuradha Mittal, the New Delhi-educated founder of the Oakland Institute, says, “Our investment policies must focus on development for all. We need to set new standards. Instead, Indian firms are using the Ethiopian government to get the dirty work done so that they can operate easily. It is appalling that India, which was once colonised, has turned into a coloniser. Ethnic indigenous communities are being hunted down like animals to clear land for Indian firms and businesses.” The SMNE is planning to bring a delegation to India later this year to raise awareness about the impact of Indian firms in Ethiopia. Mittal argues that if people in India knew how these firms are operating, they would surely stand up. “It’s not unlike Posco and Vedanta in taking land that belongs to indigenous people,” she adds. The Ethiopian govt believes companies will bring trickledown development. Many have doubts.